The 2018 national budget will be tapped to fund the fourth tranche of the salary increase for civilian government personnel. This, after President Rodrigo Duterte signed Executive Order (EO) 76 on March 15, 2019, amending EO 201 (S. 2016). 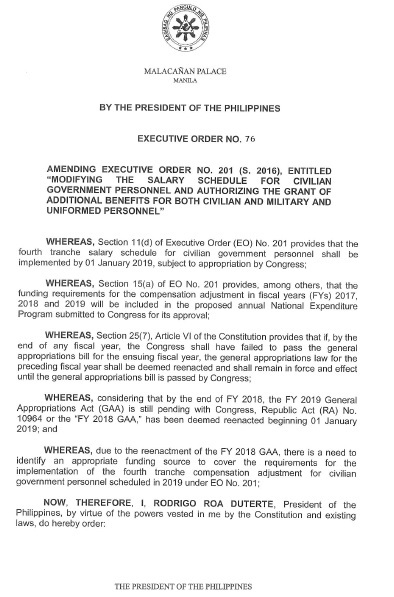 “Due to the reenactment of the Fiscal Year (FY)2018 General Appropriations Act, there is a need to identify an appropriate funding source to cover the requirements for the implementation of the fourth tranche compensation adjustment for civilian government personnel scheduled in 2019 under EO No. 201,” Duterte’s latest directive read. 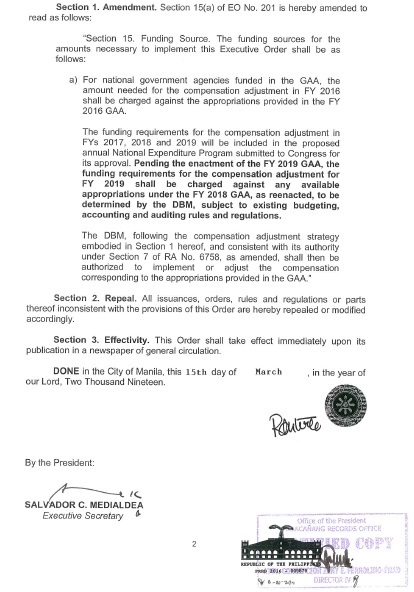 “Pending the enactment of the FY 2019 GAA, the funding requirements for the compensation adjustment for FY 2019 shall be charged against any available appropriation under the FY 2018 GAA, as reenacted, to be determined by the Department of Budget and Management, subject to existing budgeting, accounting and auditing rules and regulations,” it added. The executive order will take effect immediately upon its publication in a newspaper of general circulation.